This new high tech design introduces a new concept for the resolute attacker. Its secret lies in the two different carbon layers, which regulate both the speed and the control of this blade. The middle and somewhat thicker carbon layer offers stability while the two outer and somewhat lighter carbon layers will grant you the necessary balance of speed and confidence, in both forehand and backhand play. 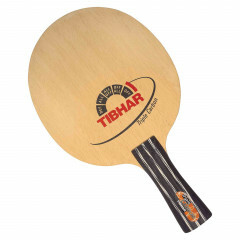 We have also selected new layers, which give this blade wonderful sensation and good control. Tibhar Blade Triple Carbon is beeing added to cart.